Lenovo’s Y920 notebook, now branded as Legion Y920, has come a long way since its first release but not from design standpoint. The real upgrade here comes with the hardware inside. Now packing the latest generation NVIDIA GeForce GTX 1070 GPU and the best gaming overclockable CPU Intel can offer – the Core i7-7820HK. 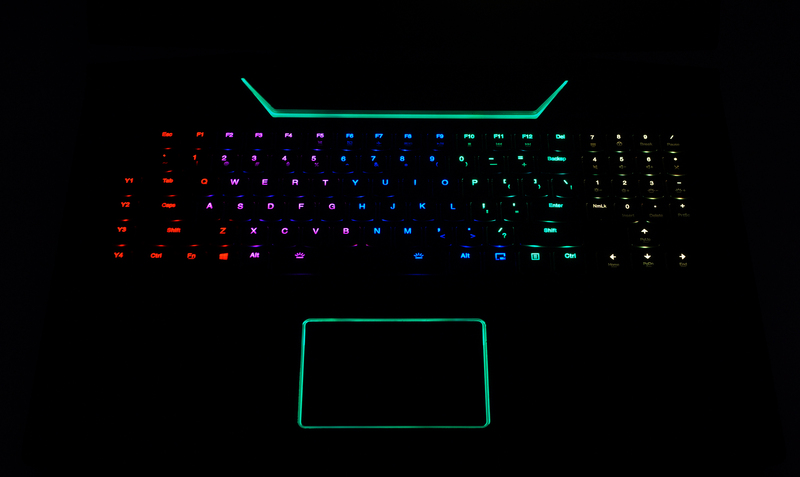 More importantly, the Y920 retains the most iconic features that make this gaming beast stand out – mechanical per-key RGB backlit keyboard, incredibly rigid construction, unusual but practical design and one key for factory overclocking on the go. Even though the Lenovo Legion Y920 appears to be a solid gaming machine, it still has a long way to go and overtake some serious competition on the market. With the recently reviewed HP Omen 17 (2017) and one of our all-time favorites, the Acer Predator 17, Lenovo’s high-end gaming solution will have some hard time competing, especially at this hefty price. 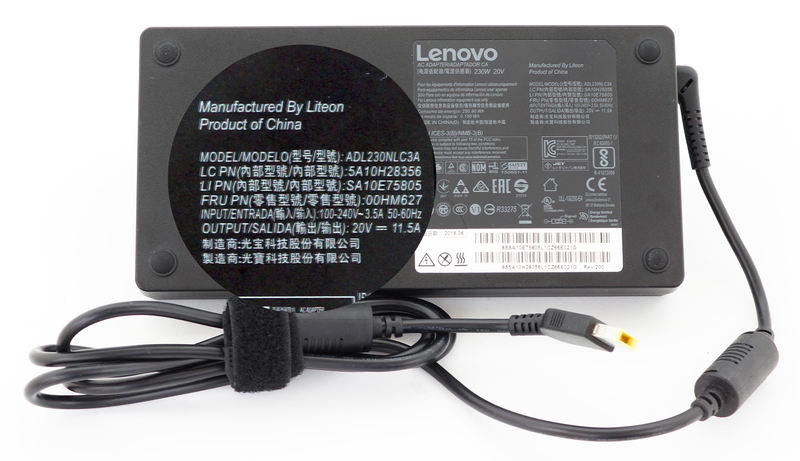 What’s Lenovo’s secret weapon here? Find out in the thorough review below. As we already mentioned, the new Legion Y920 doesn’t offer anything new in the design department. The chassis is mainly made of brushed aluminum and soft-touch matte plastic. 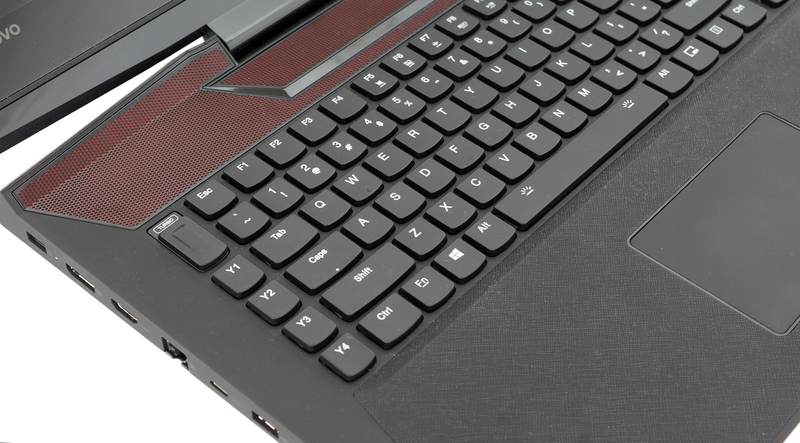 Probably due to the all-metal design, the notebook tips the scale at the impressive 4.4 kg and measures at 36 mm in height – digits that are comparable to the bulky Acer Predator 17 but considerably higher than the ASUS ROG GL702VS and HP’s new Omen 17 (2017). Starting with the lid, we immediately notice the extreme rigidity of the brushed aluminum plate. 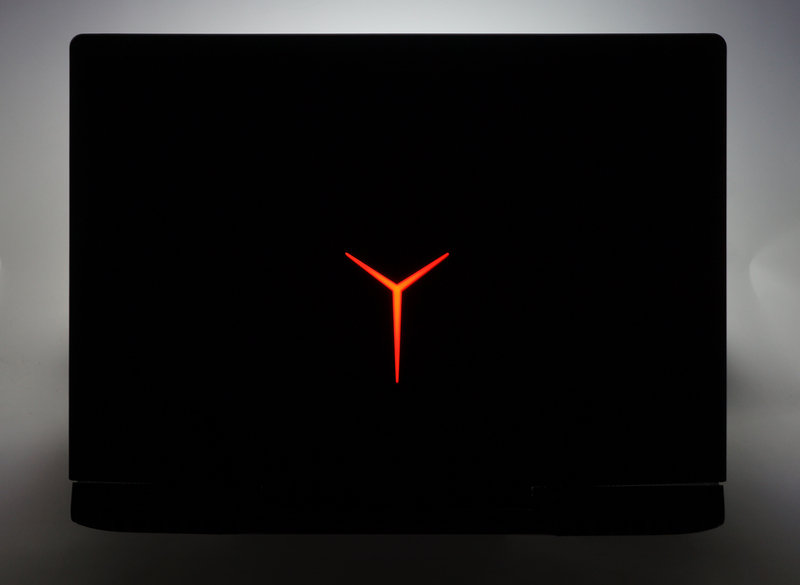 There’s only the distinguishable Legion logo in the middle and two glossy side strips (and Lenovo’s logo, of course) that stand out but the rest is just plain brushed metal finish. Pressing the middle barely bends the panel while our twisting attempts barely resulted in any flex – probably due to the wide single hinge design. Speaking of which, we think that it’s a bit overly tightened in the beginning of the travel because it poses a challenge to open the machine at first and then fails to keep the screen in place when moving the machine around. It seems that the lid is a bit too heavy for the hinge to support it in unstable environment. In any case, we appreciate the overall rigidity of the lid. 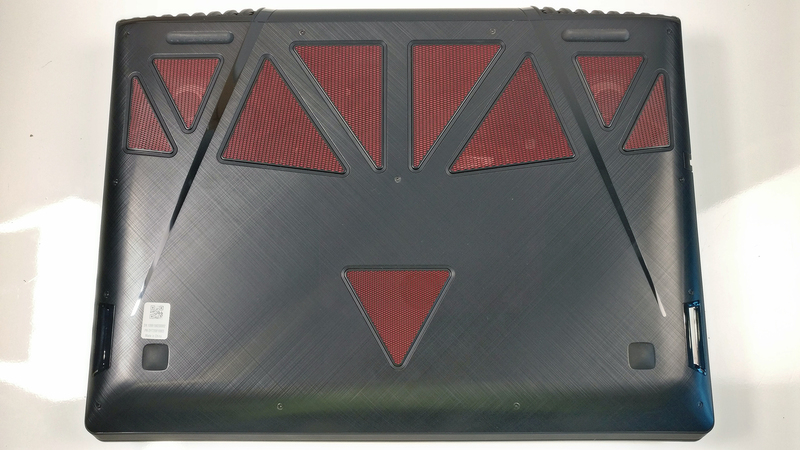 The bottom hasn’t been changed as well – brushed aluminum plate with plenty of grill openings for airflow and the subwoofer. Although the sides don’t add any more connectors compared to the previous generation, it sure does offer a big upgrade – all USB-A ports are now 3.0. But the port distribution remains the same – convenient. The left side accommodates the full-sized DisplayPort, HDMI, RJ-45 LAN, USB-C 3.1 (Thunderbolt) and two standard USB-A 3.0 ports. The right side comes with the other two USB-A 3.0 connectors, SD card reader and a set of 3.5 mm jacks for external microphone and headset. The interior and the sides are actually the same soft-touch matte plastic which means that there are no sharp or protruding edges. However, the material is a bit of a fingerprint magnet but it’s not the only one used for the whole interior. 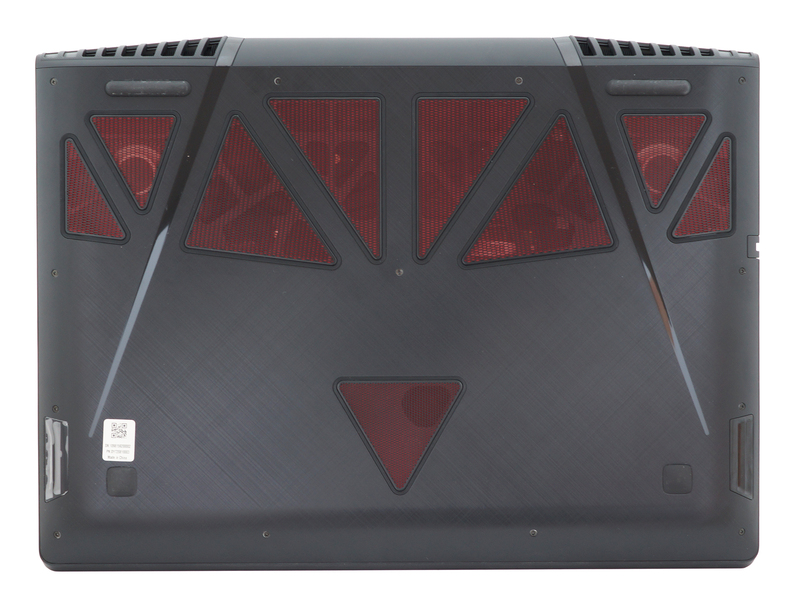 We meet again the red speaker grills on top with an LED strip along with the faux leather finish on the palm rest. 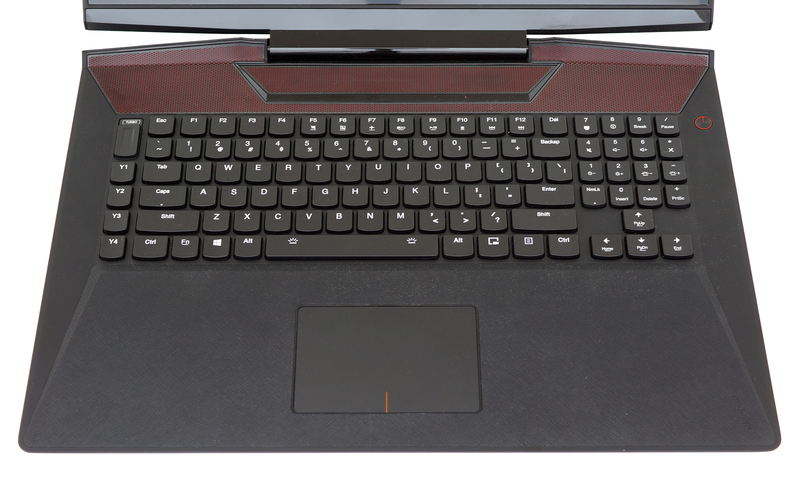 The latter is slightly elevated allowing your palms to rest comfortably while typing or gaming. It also makes the overall usability of the notebook more comfortable despite the large front lip. The rigidity isn’t sacrificed as well – pressing any part of the interior doesn’t give in at all – it just feels rock-solid. Anyway, the same keyboard layout makes a return – small Numpad block with the arrow keys below it and the four macro keys to the far left of the keyboard. Right next to the ESC key, you will find the lever switch for the fast overclocking feature but we will address this later. 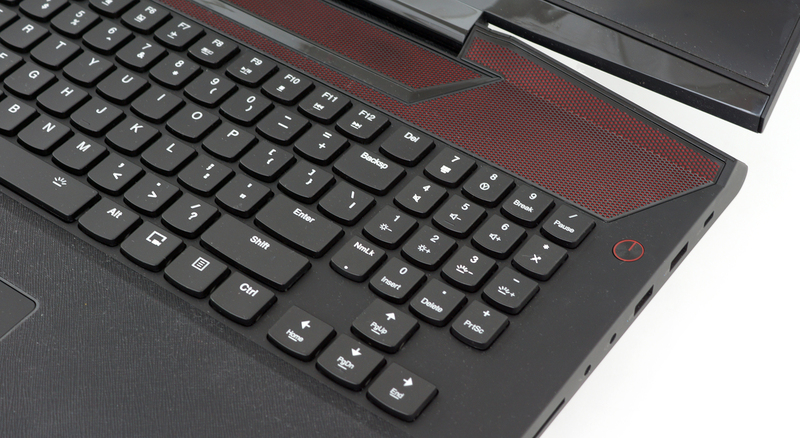 Despite the fact that the keyboard is excellently optimized for gaming (it features the same layout as the Y720), there are some things that may not appeal to the general user. For example, the distinguishable audible clicky feedback of the mechanical switches is there but the tactile feedback won’t be enough for some typers. You might even say they are a bit mushy but that’s more of a personal preference. In any case, you will be able to enjoy the usual features most mechanical switches offer and that’s fast response time and long lifespan. As for the touchpad, we didn’t like it so much. Sure, there are some notable perks like LED-illuminated edge, smooth gliding surface and light mouse clicks but the noticed a bit “sluggish” behavior and more importantly, a lot of the left mouse clicks were registered as right ones, which is quite annoying at times. At the end of the day, the Legion Y920 didn’t bring any big changes to the design and overall appearance so opinion stays the same – sturdy and rock-solid build with a good choice of materials – especially the finishing touch of the faux leather on the palm rest and the mechanical keyboard. 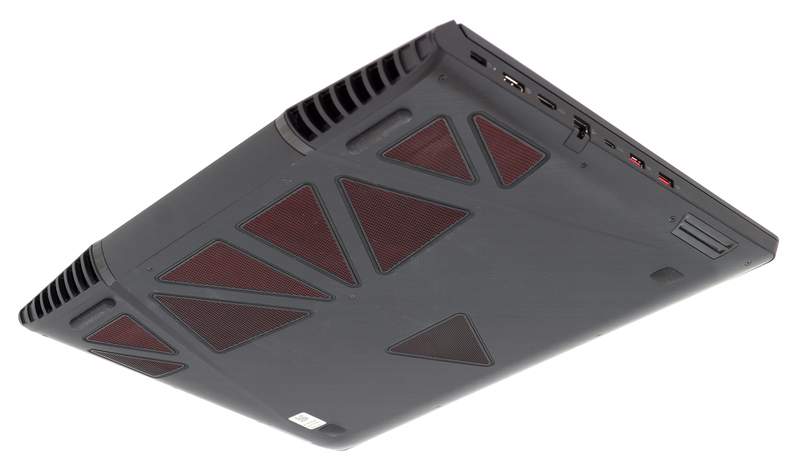 But, of course, like most gaming machines out there, the Legion Y920 is on the hefty side – weighs a lot and is very thick. In addition, the touchpad feels lacking and the screen carries a little bit too much bezel – it can be distracting sometimes. There are no service lids for easy access but the bottom piece can be removed quite easily – just unscrew all the bolts holding it and pry it up. This will give you access to all of the internals available for upgrade. 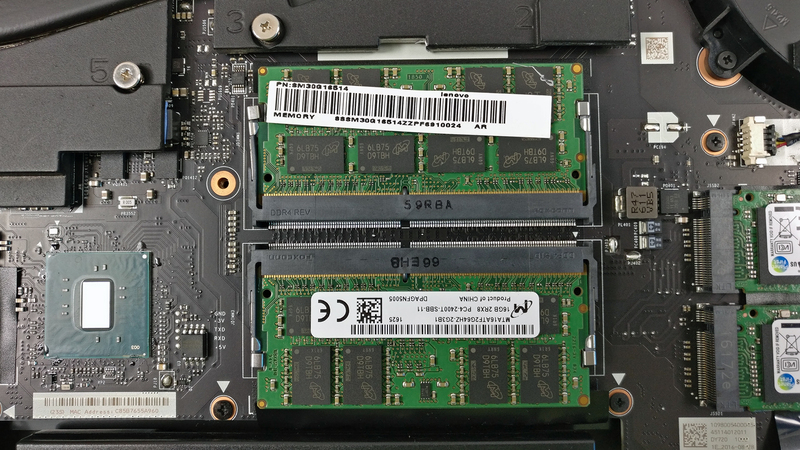 Storage configuration is quite generous – two M.2 PCIe NVMe-enabled SSD slots and a standard 2.5-inch HDD/SSD bay. 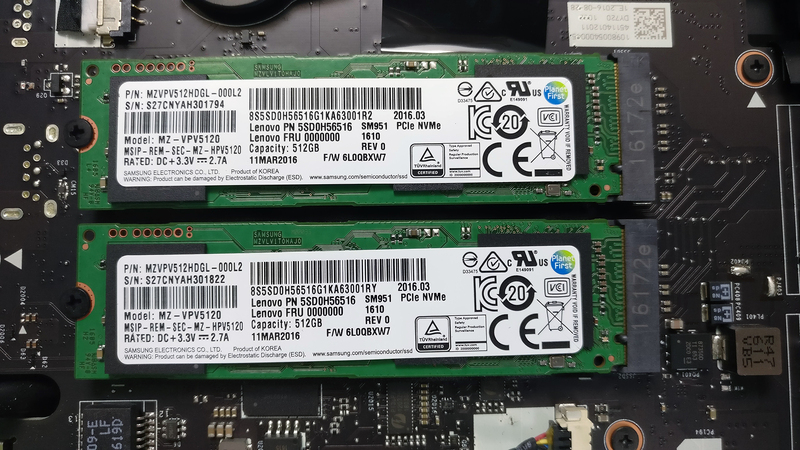 The unit we’ve tested shipped with two Samsung SM961 (2280) M.2 PCIe NVMe SSDs with 512GB capacity each working in RAID 0 mode while the HDD was WD Blue with 1TB capacity. The motherboard holds not two but four RAM slot, although, only two of them are easily accessible. If you want to go all the way up to 64GB of DDR4-2400 memory, you will need to detach and flip the motherboard around in order to access the other two. 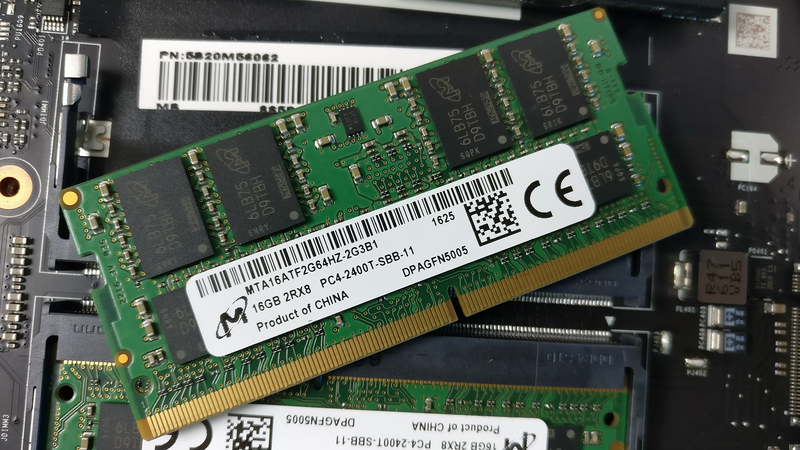 Our unit, however, shipped with 32GB of DDR4-2400 memory from Micron. 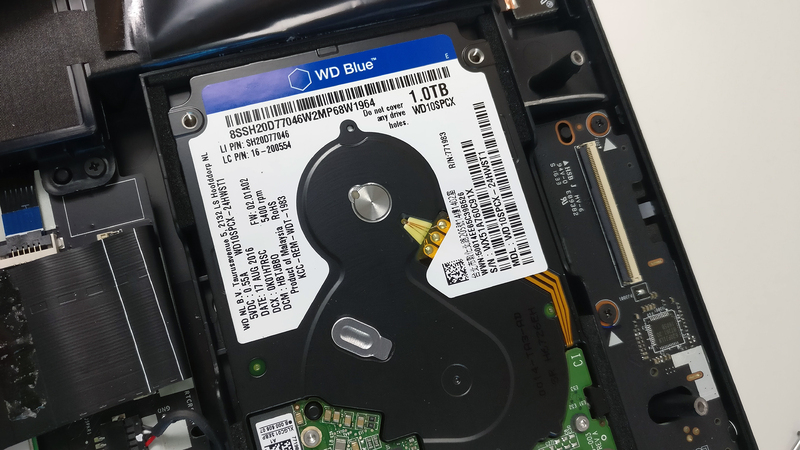 The Wi-Fi adapter is right next to the 2.5-inch drive bay and it’s Killer E2500. 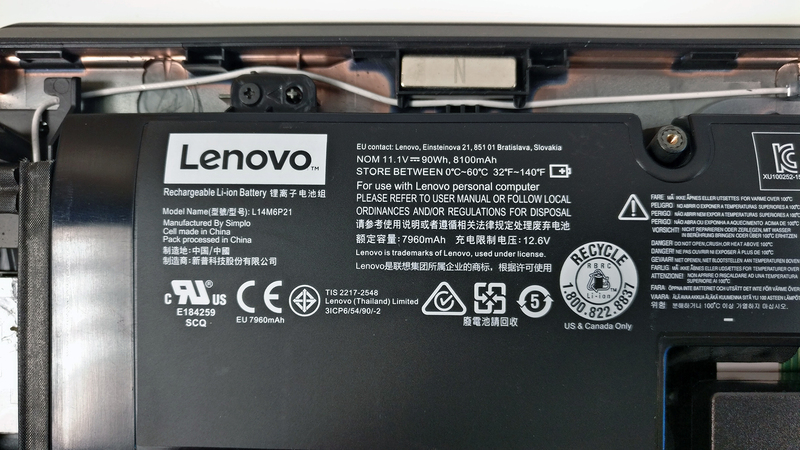 The battery is placed under the wrist rest area and it’s rated at the whopping 90Wh. The cooling design looks like a beefed-up version of the old one. It consists of two large cooling fans with metal blades and two huge heat sinks connected to them via one shared and two separated heat pipes. By the looks of it, it can handle pretty much everything you throw at it and our extreme stress tests confirm that. The notebook features an updated version of the last year’s model – an LG-made 17.3-inch Full HD (1920×1080) IPS panel with model number LP173WF4-SPF5. The pixel density is 127 ppi while the pixel pitch is 0.1995 x 0.1995 mm. It can be considered as “Retina” when viewed from a distance equal or greater than 69 cm. The laptop has comfortable viewing angles due to the IPS nature of the panel. The maximum brightness we were able to record is 408 cd/m2 in the middle and 380 cd/m2 as average across the surface with just 11% maximum deviation. This means that the display can get really bright. The color temperature on white screen at maximum brightness is 6420K – almost aligns with the optimal 6500K so the deviation is virtually unnoticeable to the naked eye. As we go along the grayscale, though, the color temperature becomes close to 6340K – slightly warmer than usual. Below you can see how values change at 140 cd/m2 (76% brightness). 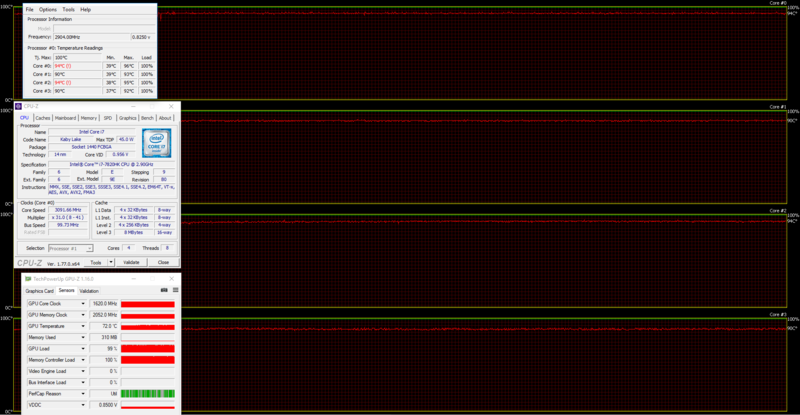 The maximum dE2000 color deviation compared to the center of the screen at 76% brightness is 3.3, which is rather acceptable since values above 4.0 are unwanted. 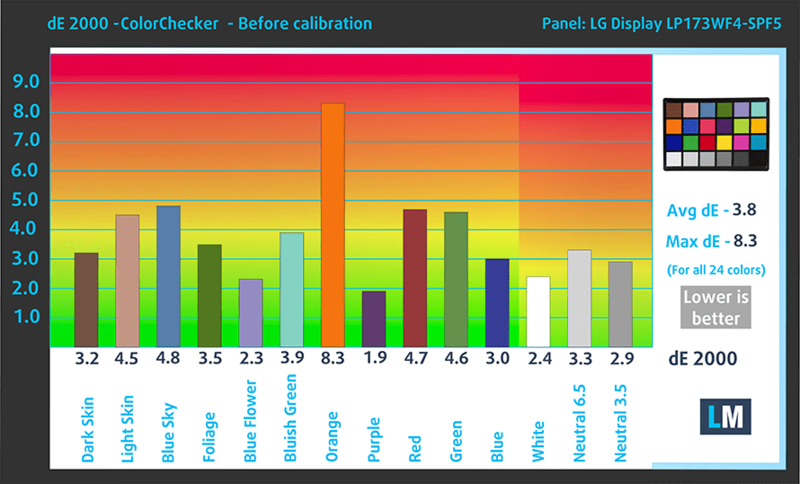 The contrast ratio is good – 970:1 before calibration and 960:1 after. 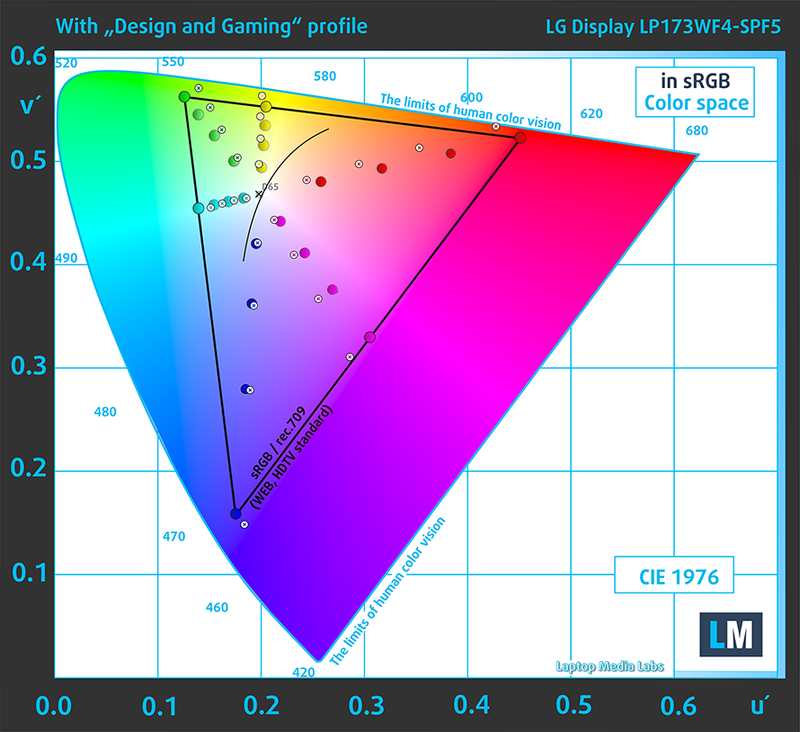 So the presented panel covers a reasonable 89% of the sRGB color gamut making it suitable for gaming and multimedia purposes. We recorded Fall Time + Rise Time = 19 ms – fairly fast for an IPS panel. Fortunately, we didn’t detect harmful light pulsations so it’s safe to say that the display is flicker-free. Our equipment, however, was able to detect small pulsations at some brightness levels but they were at extremely high frequency anyway. Yet again, the Legion Y920 offers excellent IPS panel with high maximum brightness, wide sRGB coverage and good contrast ratio. It’s also flicker-free, has 75 Hz refresh rate and incorporates the much-needed G-Sync technology but at the same time, it feels a bit lacking at times. Don’t get us wrong, the display is great but we feel like we can get a bit more for the money. There are plenty of other similarly-priced alternatives at this high-end gaming segment with 120 Hz panels or at least UHD options. In addition, the anti-reflective surface is actually pretty bad and you can sometimes see the keyboard’s LED illumination bouncing back from the screen ruining the whole viewing experience. The sound quality is really good – enough clarity in the low, mid and high frequencies. We used the already installed Windows 10 Pro for the writing of this review but if you wish to perform a clean install on your machine, we suggest downloading all of the latest drivers from Lenovo’s official support page. 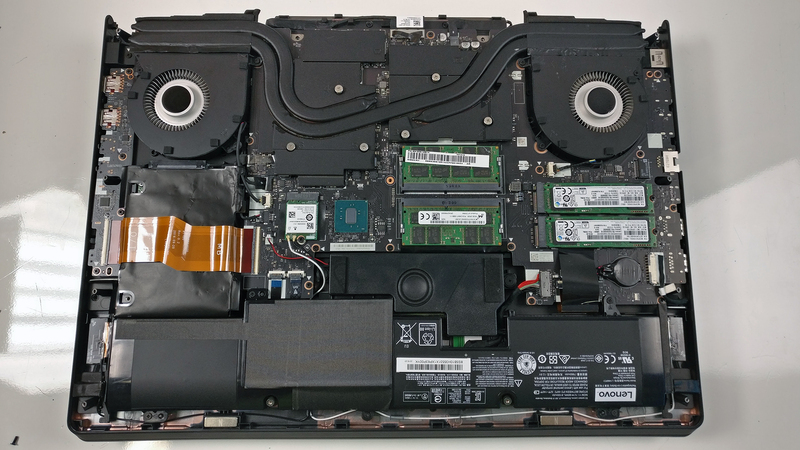 Despite the impressive 90Wh unit inside, the laptop barely survives for a few hours even during browsing or video playback. The main reason for this is the big 17.3-inch Full HD IPS panel, the demanding Core i7-7820HK processor and, of course, the always-on GTX 1070 GPU. 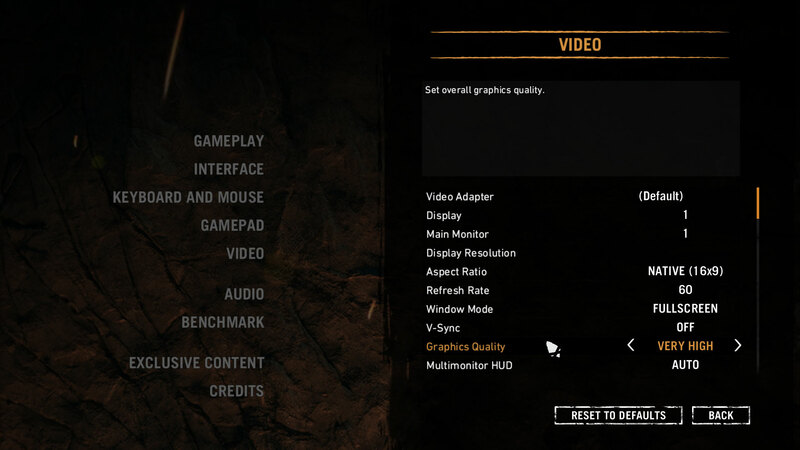 The latter doesn’t support NVIDIA Optimus (switchable graphics) feature since the laptop is equipped with a G-Sync technology that doesn’t get along with it, at least for now. All tests were performed using the same settings as always – Wi-Fi turned on, screen brightness set to 120 cd/m2 and Windows battery saving feature turned on. Barely lasted for 276 minutes (4 hours and 36 minutes) on the web browsing test. The video playback test score wasn’t all that different – 233 minutes (3 hours and 53 minutes). Of course, the laptop isn’t made for gaming away from the power source but it’s good to know that it can handle a little over an hour – 81 minutes (1 hour and 21 minutes). The Core i7-7820HK is part of Intel’s latest generation Kaby Lake processors sporting an improved 14nm+ manufacturing process allowing for slightly higher clock speeds and better efficiency, although the performance per clock hasn’t changed since this is practically the same microarchitecture as the one used for the previous Skylake chips. Anyway, the Core i7-7820HK offers higher operating frequency than its Core i7-6820HK predecessor – 2.9 – 3.9 GHz (for four active cores the Turbo Boost frequency drops to 3.5 GHz or 3.7 GHz for two active cores) vs 2.7 – 3.6 GHz but keeps most of the features like Hyper-Threading, (4/8 core/thread design), 8MB LL cache, a dual-channel DDR4-2400 or DDR3L-1600 memory controller and a TDP of 45W including the iGPU. Speaking of which, the processor integrates an Intel HD Graphics 630 chip clocked at 350 – 1150 MHz. The most noticeable feature of this processor is the unlocked multiplier for easy overclocking and usually OEMs provide the needed software for doing so. 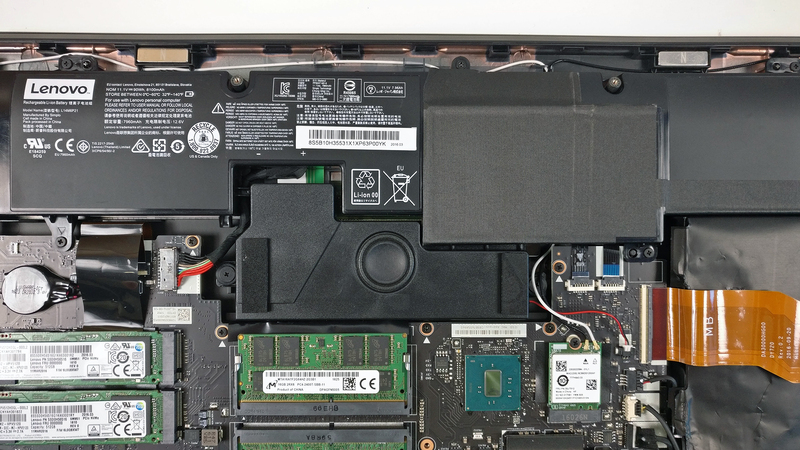 In the end, the processor’s maximum frequency can be increased depending on the notebook’s cooling system. Fritz is a chess benchmark that tests the computing capabilities of the CPU with various chess moves. The Intel Core i7-7820HK managed to get 14.655 million moves per second. For comparison, one of the most powerful computers, Deep(er) Blue, was able to squeeze out 200 million moves per second. In 1997 Deep(er) Blue even beat the famous Garry Kasparov with 3.5 to 2.5. The NVIDIA GeForce GTX 1070 is the second fastest mobile GPU after the GTX 1080. It’s part of NVIDIA’s Pascal generation of GPUs and unlike previous releases, the company finally closes the gap between mobile and desktop graphics processors and that’s why there’s no “M” in the branding of Pascal GPUs. All thanks to the 16nm TSMC manufacturing process of the GPU, which allows better thermals and overall performance in a smaller form factor. That’s a big technology jump compared to the 28nm Maxwell generation. Compared to its desktop counterpart, the GTX 1070 doesn’t differ too much. They share an identical number of ROPs (64) and identical memory – 8GB GDDR5 with 256-bit bus clocked at 8000 MHz. However, there’s a minor difference in clock speeds – the laptop GPU ticks at 1443 MHz and can go up to 1645 MHz while the desktop variant is running at 1506 MHz – 1683 MHz. 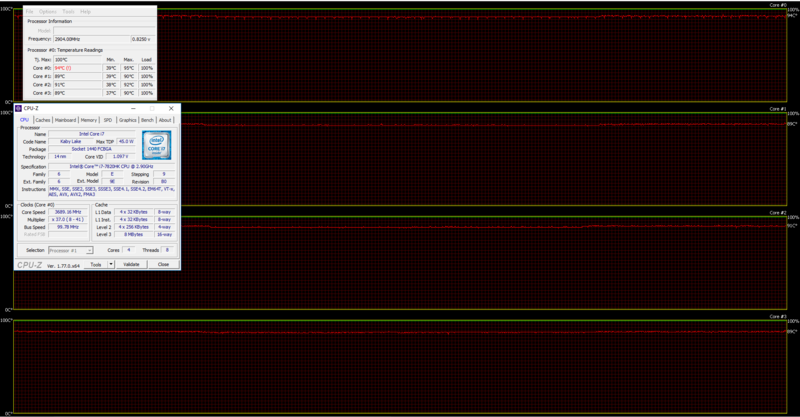 To compensate to some extent, the laptop 1070 carries more CUDA cores (2048 vs 1920) and slightly more TMUs (170 vs 120). 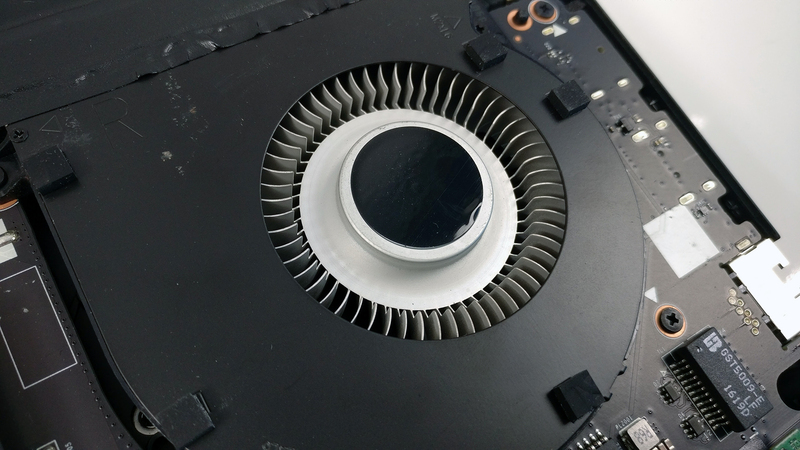 Due to its performance, thermals and power consumption, which is believed to be 10W more than the GTX 980M, the GPU is suitable for large 17-inch laptops with the appropriate cooling solution. Just like the previous generations of the Y-series notebooks, the Legion Y920 also comes with a Turbo switch lever for fast and easy overclocking on the go. Switching on the Turbo function applies the overclocked profile of the CPU and the GPU. The Core i7-7820HK gets a boost up to 4.1 GHz (3.7 GHz with four active cores) but the GTX 1070, on the other hand, receives just a small bump in clock speeds – from 1443 to 1483 MHz on the base clocks and from 1645 MHz to 1695 MHz on the boost frequencies. 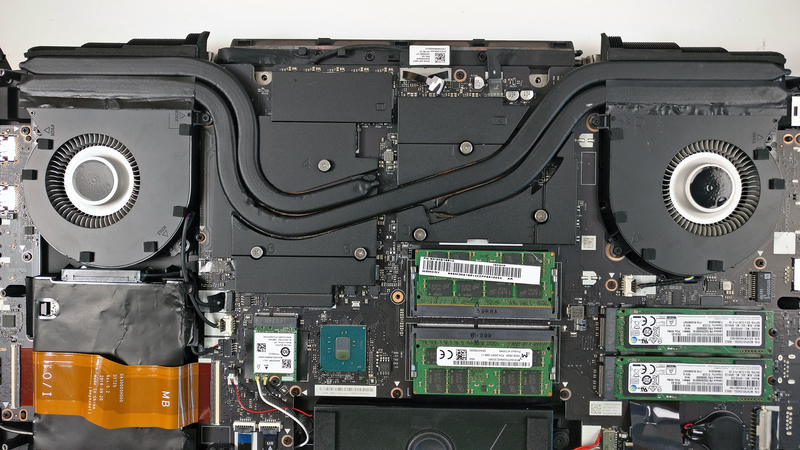 Although the stress tests that we perform do not represent real-life usage, it’s still a good way to determine whether or not the cooling system is good enough to handle the powerful hardware without pushing it to thermal throttling and overheating. When we turned on the CPU stress test, the Core i7-7820HK ran at 3.7 GHz . 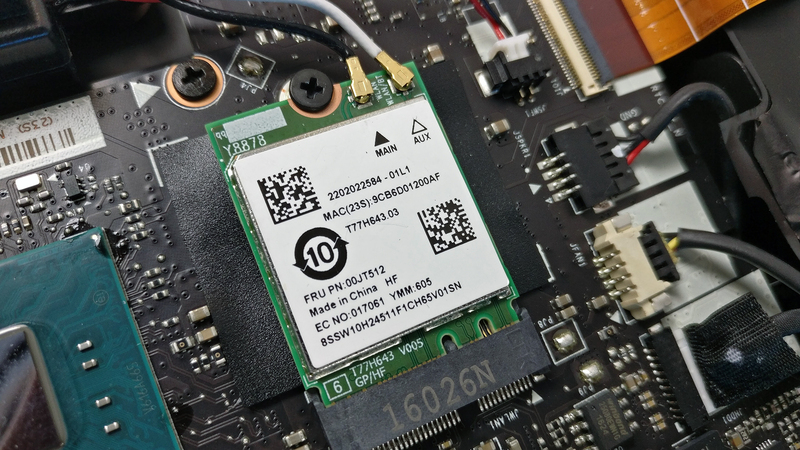 Temperatures, however, were a bit higher than usual – a bit over 90 °C but at least the system was able to utilize the full performance of the overclocked Core i7-7820HK. After an hour had passed, we turned on the GPU stress test as well – the CPU’s clock speeds slowly went down to 3.1 GHz, which is still within the Turbo Boost range while temperatures didn’t change as much. The GTX 1070, on the other hand, ran at pretty cool temperatures (72 °C) while hitting 1708 MHz at first before slowly making its way down to 1620 MHz. That’s pretty impressive for such demanding hardware. 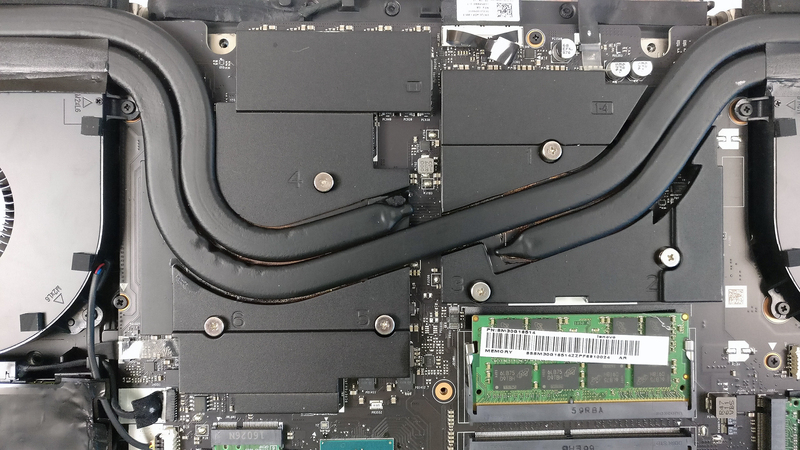 Usually, GTX 1070 and 1080 GPUs run close to 80 °C on other gaming laptops. We’ve also measured the temperatures on the surface and found them to be more than acceptable so it’s safe to say that you won’t feel any discomfort even during the most intense and time-consuming gaming sessions. However, we’ve noticed that the cooling fans were a bit loud. 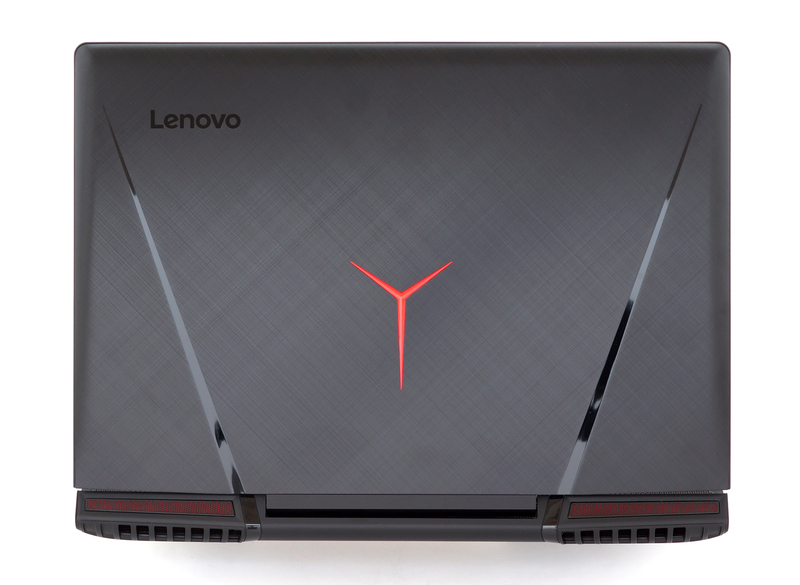 The Legion Y920 excels in almost every area in which gaming laptops should – it has great build quality, premium materials, unique features like mechanical keyboard with customizable RGB LED illumination, a neat faux leather palm rest area, good IPS display with G-Sync support, overclocking capabilities, reliable cooling system and plenty of storage options for your gaming and multimedia library (2x M.2 PCIe NVMe SSD slots (RAID 0 configurations are possible) + 2.5-inch HDD/SSD bay). However, just like every product out there, it has its downsides. For starters, the touchpad feels somehow sluggish and mouse clicks are not registered correctly. And despite the overall good image quality that the display offers, the what seems to be an “anti-glare” coating does just about the opposite – even the keyboard illumination bounces back and remains pretty visible on the screen’s surface. And those bezels are way too thick to our taste – they appear kind of distracting at times. Finally, we would have really appreciated a higher refresh rate paired with that sweet G-Sync technology. For example, the Alienware 17 R4, the ASUS ROG GL702VS and the new HP Omen 17 (2017) have 120 Hz display options, all of which are close in terms of pricing. The rest of the complaints are mostly related to gaming laptops in general, which were not solved in the Y920 – it’s pretty hefty and has subpar battery life. In return, however, you get excellent performing cooling system that handles the overclocked hardware even under extreme conditions. So do we recommend the Legion Y920 over the competition? As always, it really depends on what you are looking for. The 17-inch gaming laptop segment is oversaturated and everyone can find the one that suits them best – it depends on what you are looking for. Each one comes with its own unique features and most certainly, the Legion Y920 impresses with cool mechanical keyboard, functional design (in most cases) and well-built cooling solution. 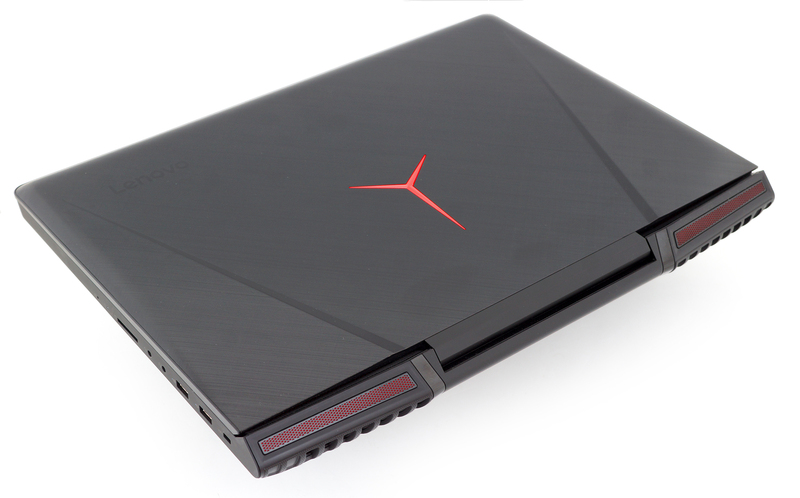 In any case, you should also look into the alternatives like Acer Predator 17, Alienware 17 R4, HP Omen 17 (2017) and the ASUS ROG GL702VS as the most recent GTX 1070 bearer.